On April 22, “Water for Elephants” opened in theaters everywhere. Starring Robert Pattinson, Reese Witherspoon and Christoph Waltz, the movie takes place in a circus in the 1930’s so they brought in Hollywood’s favorite jugglers, Jack & Jeri. Our Show is Now More Self-Contained! This year, we invested in the Mediastar audio controller which allows us to remotely run all our sound cues ourselves. No more will we depend on an inexperienced sound operator to get it right. (It took a couple of disasters to learn this lesson.) We are very happy with the new system which has been reliable and efficient. Jack & Jeri’s children Max and Oz enjoy getting in on the act. 5-year-old Max continues to pick up circus skills. He loves walking on his stilts. Jeri trains hand-to-hand with acro friend Dave Floyd. Come See Jack & Jeri at the L.A. Comedy Festival! 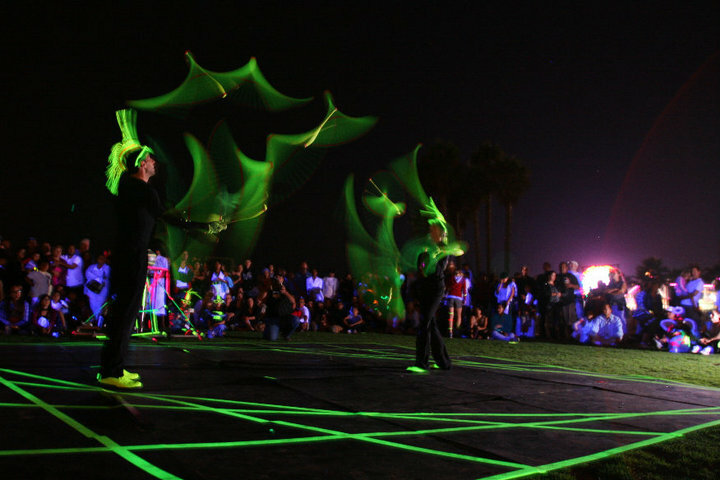 Last month we received rave reviews during our week at the Magic Castle. If you missed it, this should be an excellent opportunity to see us live. The stage at ACME is much bigger and we’ll be able to do much more. 135 N. La Brea Avenue; Los Angeles, CA 90036. We’ll be doing 30 minutes, and there are two other acts in each show. I have now officially been a professional entertainer for over 20 years. Just over 20 years ago I quit my last “real job” as an engineer at IBM Research. What would have happened if I had stayed an engineer? Who knows. Maybe I would have retired by now, or maybe I’d be unemployed and homeless. Maybe I wouldn’t be alive at all. You never know. But I do know I’m happy with my decision and it’s been a good twenty years. I’ve gotten to see the world and make a lot of people happy doing what I love. I’m ready for at least another 20. 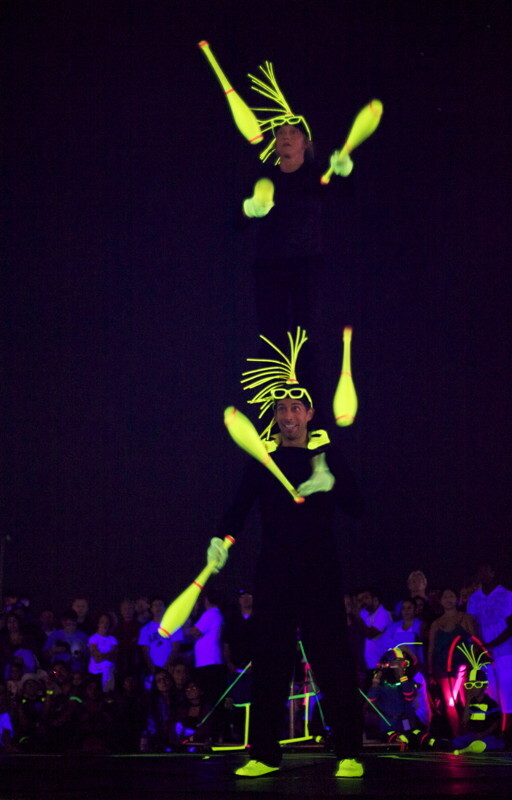 New Glow Juggling and Acrobatic Act! To better stay in touch, and make the world a better place, we’re sending out monthly newsletters. If you would like to have our newsletters emailed to you, please contact Jack.